Priyaranjan Kumar, Regional Executive Director, Capital Markets, Asia Pacific at Cushman & Wakefield and their ‘Winning in Growth Cities’ report shows Hong Kong's rise up the rankings to make global top 5, behind New York, Los Angeles, London and Paris. Despite geopolitical uncertainty and a slowing in the economic cycle, investment in the global property market has seen a significant rise of 18% year-on-year to a new record high of US$1.8tn (2017: $1.5tn) in the 12 months to June, according to Cushman & Wakefield’s ‘Winning in Growth Cities’ report. This annual report examines global commercial real estate investment activity, assessing cities by their success at attracting capital. buyers responsible for 45% of all cross-border investment. New York remains the largest real estate city in the world, followed by Los Angeles, London, Paris and Hong Kong. Hong Kong is the second most sought-after city for cross-border investments globally, behind London. The city’s buoyant position is the result of capital controls encouraging mainland Chinese investors to concentrate their allocations closer to home, resulting in continental investment in the city rising by 259% year-on-year. Asian cities account for three of the top 10 in 2018 compared to none the year before, as Shanghai and Tokyo improved as targets for cross-border capital. For the ninth time in 10 years, London is the top city for attracting international real estate investment. Having increased transaction volumes into London by 47% over the year to US$10.9bn, Asian investors are the strongest source of cross-border capital into the city, with offices being the overwhelming target for these deals, as the sector attracts a 94% market share of APAC flows into London. Investment volumes will continue to be stable at current record levels. A strong US dollar coupled with protectionist trade rhetoric will likely cloud expectations and cause occasional bouts of volatility. However, strong GDP growth, benign though rising inflation, rapid urbanization and falling unemployment underpin Asia’s attraction for global property investors. Strong demand for core assets will continue to support pricing and historically low yields. Significantly more capital will be allocated to value add and opportunistic strategies in gateway markets where occupier markets are healthy enough to compensate for additional risk. 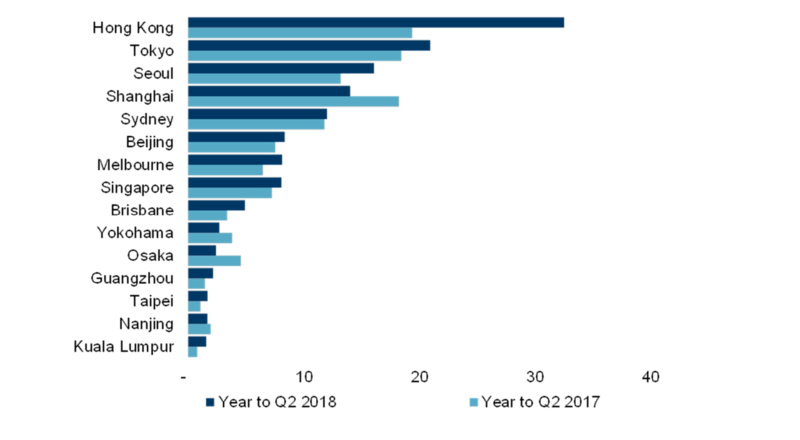 Equity investors are focused on CBDs with rental growth and disciplined supply; standouts being Tokyo, Sydney, Melbourne, Singapore, Hong Kong, Shanghai and Beijing. Within emerging markets, India and Vietnam will continue to outperform though at a slower pace given external economic pressures. While Hong Kong was the top ranked Asian city in 2018 and continues to be in favour, more China cities are also likely to feature as investment destinations in the near future and this could be in decentralised and emerging CBD areas as well as in cities linked to the BRI (Belt and Road initiatives). “Improving resolution of NPLs (Non-Performing Loans) across Asia will offer significant opportunities for market access to credit platforms and we expect private debt to see sharp origination across all major markets. Within the alternative space, sectors such as PRS (Private Rented Sector) / Built-to-Rent residential (senior living, PBSA – Purpose Built Student Accommodation, corporate housing, co-living) and data centres will continue to see massive build outs. Logistics development will remain a key focus for industrial platforms,” noted Mr. Kumar. Click here to download the Winning In Growth Cities 2018/2019 - Cushman & Wakefield Report. To discuss the report or make an enquiry email Priyaranjan Kumar, Regional Executive Director, Capital Markets, Asia Pacific at Cushman & Wakefield via the contact details below.